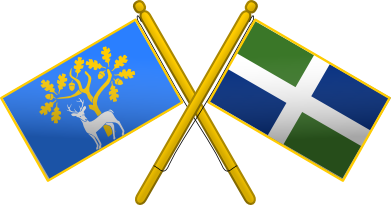 We are campaigning for the establishment of county flags for Berkshire and Oxfordshire. Since the addition of Buckinghamshire’s traditional flag to the UK Flag Registry, the pace of the campaign has increased and the Association of British Counties is now bringing the campaigns for the two flags together. The Thames both divides and unites the two counties, and their identities are closely knit. In recognition of the special relationship between the two counties, the Association of British Counties proposes a shared voting process to establish a recognised flag for both counties. Residence in a county is not a prerequisite for a sense of belonging. Indeed where we live now, where we grew up, and where we might hope to live, all influence how we identify with the counties. The great thing about county flags is that they can be flown in any county and transcend boundaries. Participation in the campaign (and eventual vote) is not restricted to residents of either county. If you would like to submit your own proposal, please contact us on the form above. How is the campaign going so far?? I very much support the idea of a county flag for Berkshire. However, with respect, I feel that the one suggested doesn’t really represent the “Royal County of Berkshire” and looks too contrived. Most bonafide flags have either a St George’s cross, a saltire or stripes. Therefore, I suggest a white St George’s cross like the Oxfordshire flag, with blue top left and bottom right, representing the river Thames / Thames valley, and red top right & bottom left representing royalty. Another idea would be to have the gold/yellow Wessex dragon in the centre, as Berkshire marks the boundary of the Kingdom of Wessex. It’s interesting you say that the Berkshire proposal does not represent Berkshire for you. The stag-and-oak emblem comes from the coat of arms from the old Berkshire County Council, but the emblem goes back much further than that and is connected to the legend of Herne the Hunter. You may wish to see the flag blog maintained by the ABC Flag Officer: http://flags.abcounties.com/2014/01/28/berkshire-2/ for more information. Please do have a go drawing your ideas up and send them in however, as there is no right or wrong answer. Ultimately a competition will be established for both flags and entries will be invited. 1 Pings/Trackbacks for "Berkshire and Oxfordshire Flags Campaign"